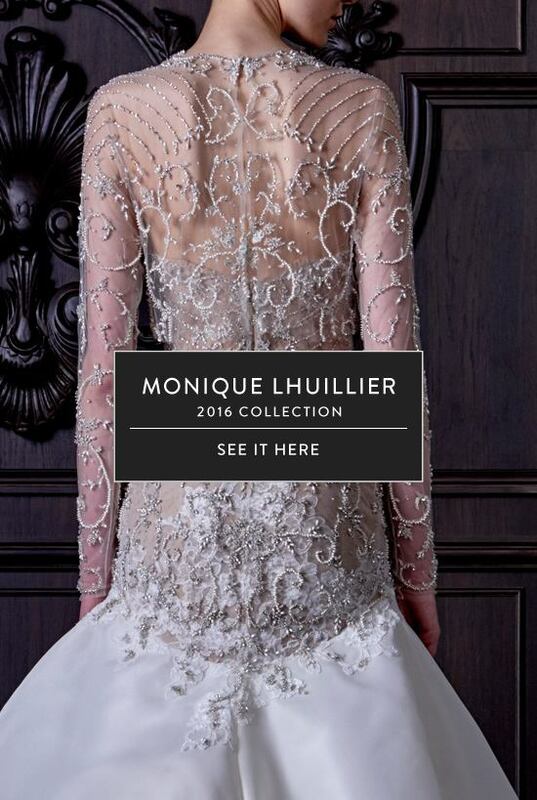 Monique Lhuillier 2016 Bridal Collection draws inspiration from the fairy tale Alice in Wonderland. Following Alices path of fantasy and curiosity, the gowns transform into magical imaginations and beautiful enchantments. Each gown balances the line between modern allure and playful grandeur. From embellished sheaths and embroidered trumpet silhouettes to glamorous voluminous gowns, each piece embodies a modern fantasy. Delicate embroidery, floral lace appliqués, layers of tulle and intricate embellishment bring a magical quality to each dress. While deep V- Necklines, cut outs and low back detailing add an element of sensuality to the collection. Neutral shades of blush, honey, mist and sky blue complete this collection.